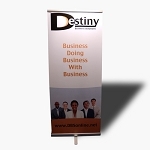 Full color vinyl banner with retractable banner stand or x-back banner stands. Perfect for seminars, meeting or trade shows! Both choices also come with there own carrying case for ultimate convenience when traveling.